Shopping for media-streaming hardware? You've come to the right place. This is the definitive guide to choosing precisely the right model for your unique needs. 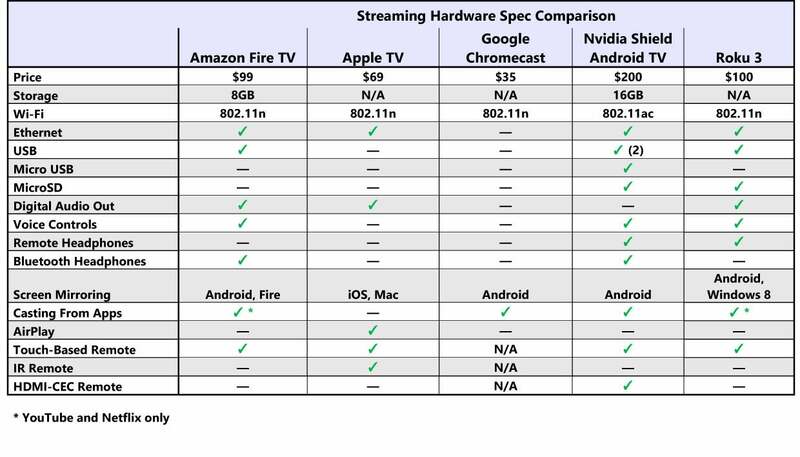 Finding the right streaming media player used to be simple, but in recent years the number of hardware options have proliferated, features have grown more sophisticated, and price ranges have expanded in both directions. At the same time, the number of streaming video apps has exploded, with most set-top boxes opening up their own app stores. That means you’re not just considering hardware and software, but ecosystems as well. Our buying guide will arm you with everything you need to make an informed decision. 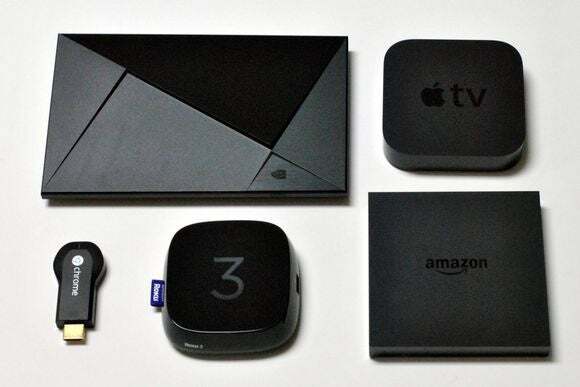 First, we’ll explain all the potential factors for your purchase, then we’ll jump into reviews for the media streamers we think are most worthy of your attention: Amazon Fire TV, Apple TV, Google Chromecast, Nvidia Shield Android TV, and Roku 3. Without question, apps and services should be the biggest factor in any set-top box purchase, because nothing else matters if you’re not getting the content you want. The good news is that every set-top box covers the basics, like Netflix, Hulu, HBO Go, and YouTube. Still, each platform has its quirks and missing pieces, so you’ll want to pay close attention to our app comparison chart at the bottom of this section. Roku 3, for instance, has the most complete app selection, but like all other non-Apple devices it can’t access iTunes purchases. 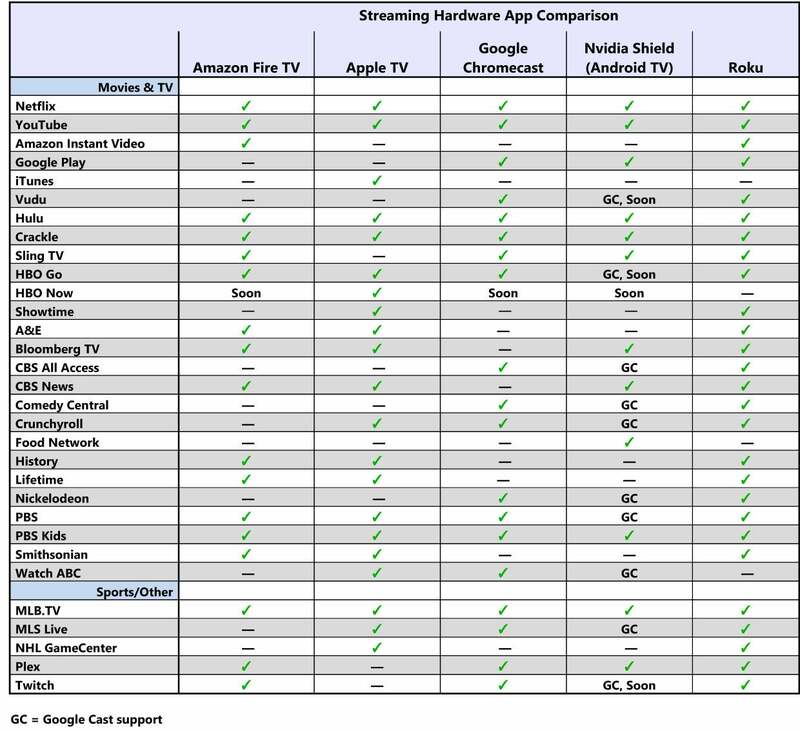 Meanwhile, Apple TV is missing apps for Amazon Instant Video, Sling TV, and Plex. 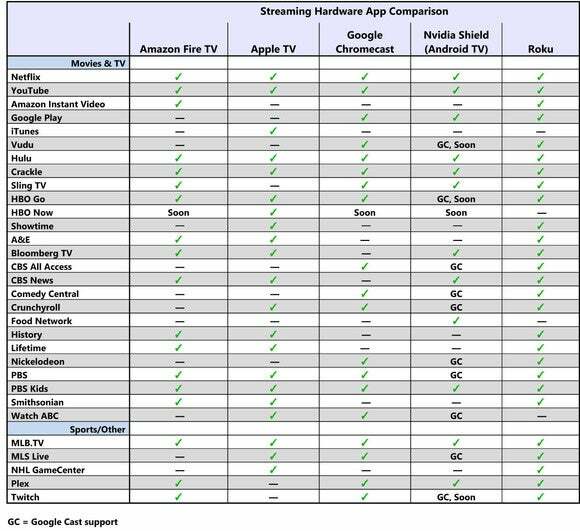 The Nvidia Shield Android TV covers for its ho-hum app selection through Google Cast support, which lets you launch content from a phone or tablet (marked GC on the chart), but it lacks support for Amazon Instant Video. The Roku 3 supports the largest number of apps, but no media streamer delivers everything you might want. If you have an older TV without HDMI input, none of the devices on our list will work without a converter. The only other option is the $50 Roku 1, which has composite video output but is slower than newer Roku models. The remotes that come with most streaming boxes are exercises in minimalism compared to the traditional cable-box clunker, but each of the remotes we’re comparing is unique in its own way. The Apple TV remote is the slickest looking, but lacks voice search and dedicated fast forward/rewind buttons. Both Roku’s and Amazon’s remotes have voice and playback controls, but the Roku 3 goes further with dedicated buttons for launching Netflix, Amazon, Rdio, and Hulu. It also has a headphone jack for private listening, whereas the Amazon Fire TV requires a set of Bluetooth headphones. 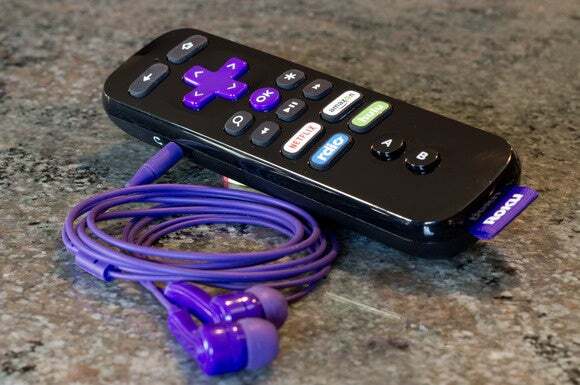 The Roku 3 remote uses RF to communicate with the media streamer, and it has a handy headphone jack for private listening. Nvidia's Shield Android TV is a different beast altogether, as it ships with a game controller instead of a standard remote. You can still voice search and plug headphones into it, but a less-intimidating remote for non-gamers costs an extra $50. Alternatively, the Shield supports full HDMI-CEC controls, which means you can control it with your existing TV remote. The line-of-sight requirements of infrared remotes can be an issue if you’re planning to hide your set-top box inside your entertainment center. The Apple TV uses infrared, and therefore must be in plain view, though the use of IR means you can program other remotes to control it. Signals from an RF (radio frequency) remote can penetrate cabinet doors, although their range is not unlimited. Screen Mirroring: The basic act of duplicating your phone or tablet display on the television. It’s a battery hog, but can work for watching certain apps or showing off some photos from your phone. Casting: The phone or tablet tells the set-top box to start streaming music or video from the Internet. Doesn’t affect battery life, and content keeps playing even if the casting device disconnects, but may not work with all apps. AirPlay: The iPhone or iPad beams music or video to the television, but doesn’t mirror its own display. Works with nearly all apps, but can affect battery life and prevents sound from playing on the phone or tablet. Touch-based remote: Duplicates the buttons of a physical remote control. Works in a pinch when the real remote’s gone missing. 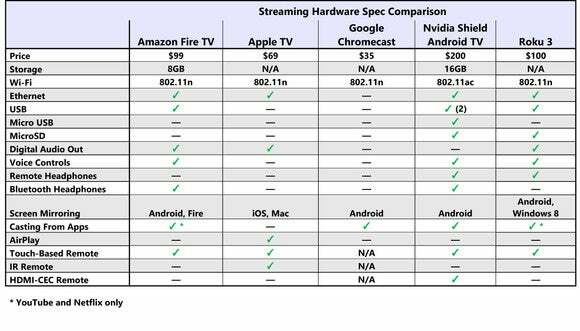 Nvidia's Shield Android TV wins the specs battle, but it's also the most expensive streaming hardware you can put in your entertainment center (shy of a video-game console or home-theater PC, that is). Why include Chromecast, then? Google’s stick is controlled entirely through apps on your phone or tablet. To watch Netflix, for instance, you open the Netflix’s existing phone or tablet app, hit the “Cast” button, and pick the video you want. The sluggishness of other sticks is a non-issue with Chromecast, as it’s arguably even faster than thumbing around on a remote control. Did you just skip to the bottom of this piece looking for our recommendation? That's okay, we’re comfortable choosing Roku 3 as the best all-around option. It has the widest app selection (with Apple content being a noteworthy exception), a simple menu system, powerful voice search, and some pleasant bells and whistles, such as a headphone jack on the remote control. It simply gets the job done, even if its design and interface look a little dated next to the competition. If you can live with its more frustrating qualities, Nvidia's Shield Android TV is the set-top box for those who want it all and want it now. For Amazon Prime subscribers, Fire TV promises less time spent browsing and more time watching. Everyone else might feel left out. Voice search doesn't search all content sources. Needs some more apps, and even some Amazon-provided features weren't live on Day 1.